In this Feb. 15, 2018, photo, Susan Prendergast, reference supervisor at the Eudora Welty Library, in Jackson, Mississippi, adds additional federal tax filing information booklets on a shelf adjacent to her desk. AUGUSTA, Maine — In a bid to conform Maine’s tax code with recent federal changes, Gov. Paul LePage’s administration on Thursday proposed $88.2 million in state tax cuts through next year with breaks aimed at parents and businesses. Democrats are likely to signal opposition to parts of the Republican governor’s tax conformity plan. It may be a key issue of the 2018 legislative session, just as it was two years ago before a compromise deal mixing tax cuts with additional school funding. Conformity is arcane, but it gives lawmakers leeway to change the tax code. 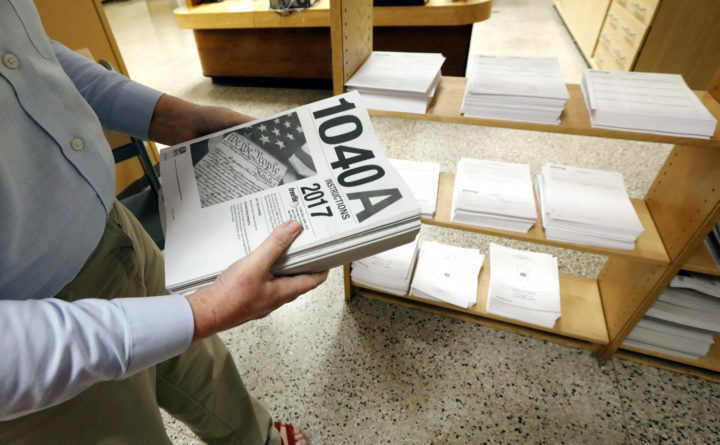 States regularly move to generally conform to the federal tax code after Congress makes minor changes. But last year, congressional Republicans passed the first major overhaul in a generation. The LePage administration rolled out its plan on Thursday to the Legislature’s budget and tax committees after teasing it for much of this year. A January report from the Maine Department of Administrative and Financial Services said the new tax bill will provide a $1 billion economic benefit to Maine taxpayers in 2019. However, the report also said that full conformity would amount to a $250 million state tax hike. That’s largely due to the federal elimination of a personal exemption that is still in Maine law that would be difficult to continue to administer without federal enforcement. The LePage administration’s plan would replace it with a new zero percent tax bracket for the first $4,150 of an individual’s earnings and $8,300 for a married couple. It would add a non-refundable child and dependent tax credit and double Maine’s estate tax exemption, matching the federal package. It also contains several business tax cuts that the LePage administration says would be neutral, adding bonus depreciation, which gives businesses up-front deductions on certain purchases to replacing the similar Maine Capital Investment Tax Credit. Maine also would get $31 million in one-time revenue from repatriation of foreign profits. Another element of the proposal would lower Maine’s top corporate income tax rate from 8.93 percent to 8.33 percent to offset tax hikes that the administration said would come if the state conformed fully. The $88.2 million cost of the bill relies heavily on rosy revenue projections. Maine’s Revenue Forecasting Committee said the state will see $128 million more than previously expected through the end of the current budget cycle in 2019. Rep. Ryan Tipping, D-Orono, the co-chairman of the Legislature’s taxation committee, called the package “mixed,” saying while some changes help small businesses, others help “folks who don’t need the help right now” who benefited from federal corporate tax cuts.